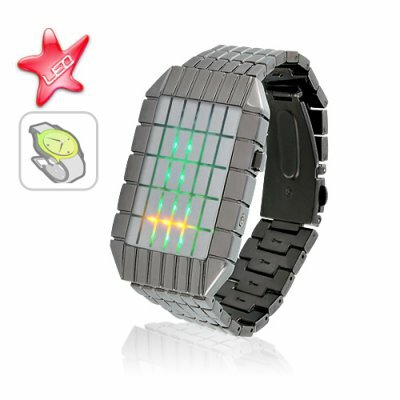 Successfully Added Influx - Japanese Style Inspired Red Orange Green LED Watch to your Shopping Cart. Light up your world with the Influx Japanese Inspired LED Watch. Featuring a playful, yet majestic array of red, orange, and green, the Influx LED Watch emanates an aura of sophistication and is made for those who can appreciate the finer things in life. Proudly wear the Influx LED Watch, as it is more than just a high quality timepiece; it's also a symbol of status that is only fit for the fashionable and chic. Each red, orange, and green LED beams with perfect radiance and mesmerizes any who dare gaze at its brilliance. The Influx LED Watch comes with more than just looks, however. What else can contain its majestic aura other than a top grade alloy-zinc construction, which protects everything from the watch frame to each individual link of the watch strap and is only appropriate for such a rare timepiece. Just Google "Japanese LED Watch" to see how much these timepieces sell for online. Notice how they normally retail for close to 10 times the price we're selling them for. Even if you don't intend on buying one for yourself, stock your online store with these eye-catching watches to lock in some amazing profits! Brought to you by the leader in direct from China wholesale electronics - Chinavasion. Normally sells for around $200 USD! How do I change the time, date, and luminosity on this watch? Simply insert a tapered point into the lower button on the right side of the watch. This will cause the current setting to blink. Continue pressing the lower button until you arrive at the setting you want to change. Next, press the top button to change the information. This blue LED watch uses two CR2032 watch batteries. Other names this type of battery goes by are button cell, silver button cell, or coin cell batteries. The batteries should last longer than with a normal watch since time and date information is only displayed when you want or every 15 minutes. No, it is better because it costs almost 1/10th the price of a Tokyo Flash watch and is also backed by Chinavasion's famous 12 month warranty.